Horse racing has a long and fascinating history, so it’s hard to pick out the most memorable moments. However, after much thought and deliberation, we’ve managed to come up with a list we’re quite happy with. Take a look. As it’s the most popular horse race in the world, the Grand National never disappoints. But the 1973 race is legendary. Crisp dominated the race, running far ahead of the other horses despite being the heaviest horse in the field. When he reached the second-to-last fence, he led the race by an impressive 20 lengths and the audience expected him to win. However, after running such a gruelling race, Crisp started to lag slightly. Red Rum took the opportunity to catch up with Crisp – and with one final, impressive push, he won the race by three-quarters of a length. The race made Red Rum an iconic figure, and he went on to win two more Grand Nationals afterwards. This fantastic two-part cliffhanger spanned over the 2008 and 2009 Cheltenham Gold Cup events. Initially, Kauto Star was the reigning champion, but many people anticipated that Denman could take the Gold Cup from him. 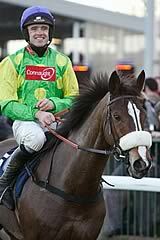 After a close race, Denman stole the crown and won the 2008 race, with Kauto Star coming in a close second. The two went head-to-head again at the 2009 Gold Cup, in a highly anticipated rematch. To everyone’s surprise, Kauto Star completely dominated the race this time round, winning by a phenomenal 13 lengths. This incident is often dubbed “The Race of the Century” and it pitched two fantastic European champions against each other: the three-year-old Grundy vs. the four-year-old Bustino. Both horses and their jockeys pushed the boundaries of what many thought was physically possible on a race track, by running at an unbelievably fast pace for the full race. The pair were neck-and-neck throughout, in a truly nail-biting contest, and it was impossible to tell who would come out on top. Although both horses performed phenomenally well, Grundy won by just half a length – pulling out and clinching the win in the last few tense moments. Grundy also set a record that day, winning in the fastest time ever recorded for the race. He made just one more professional appearance before retiring. The 2009 Kentucky Derby began with less-than-ideal conditions. Rain from the previous night meant that the ground was damp and soggy. Mine That Bird and his other competitors had trouble coming out of the gates, resulting in a worryingly slow start to the race. Moreover, Mine That Bird had odds of just 50/1 making him a real outsider. Just seconds into the race, he found himself 8 lengths behind. Commentators didn’t even mention Mine That Bird until halfway through the race. However, once he found his feet, there was no stopping him. He caught up with the other horses, and won by an impressive six and three-quarter lengths, streaking ahead in the very final moments. Not only that, Mine That Bird actually won the race in the fastest time recorded at the Kentucky Derby since 1973 – in just 23.77 seconds. If you have your own favourite moment and think we should’ve included it, tweet us and let us know! This article is written by Bet AU, Australia’s leading sports betting website.